I wasn’t sure if Oakland Hills was going to happen – but man did I want it to. 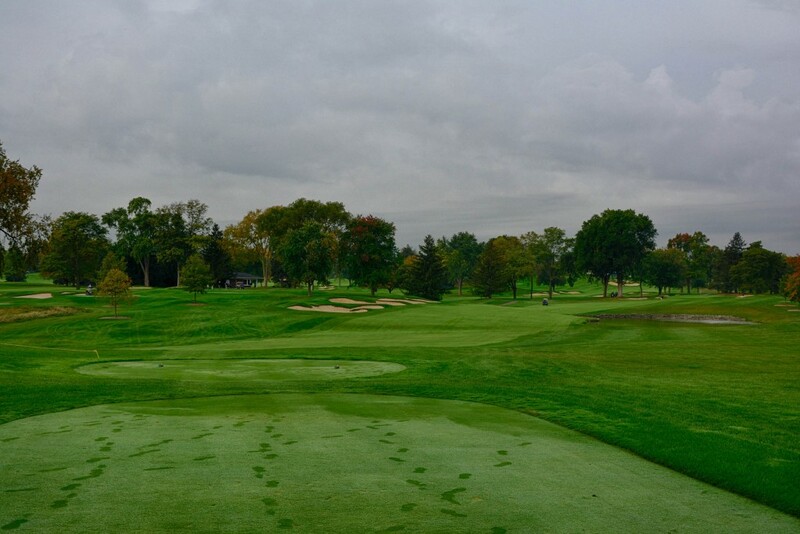 Medinah was pretty straight forward, Oakland Hills, not so much. The common answer: “It was a friend of a friends, dad’s business partner’s, business partner” – and that pretty much sums it up. I’m learning that a big part of the fun of going for the Top 100 is all of the cool people you meet along the way and the interesting circumstances that will have to present themselves in order to get on the courses. 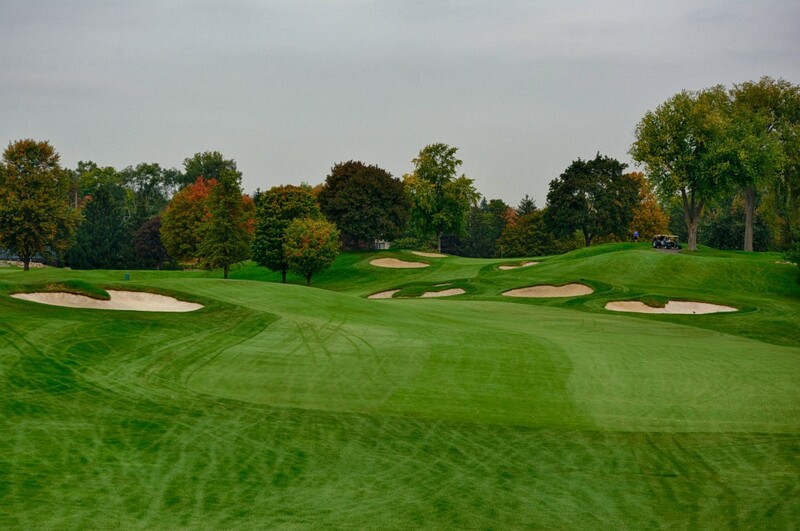 After playing Medinah the week prior, I was kind of expecting Oakland Hills to look a lot like that. Long winding entrance way with very grandiose feeling, looking grounds. The reality wasn’t actually quite like that. 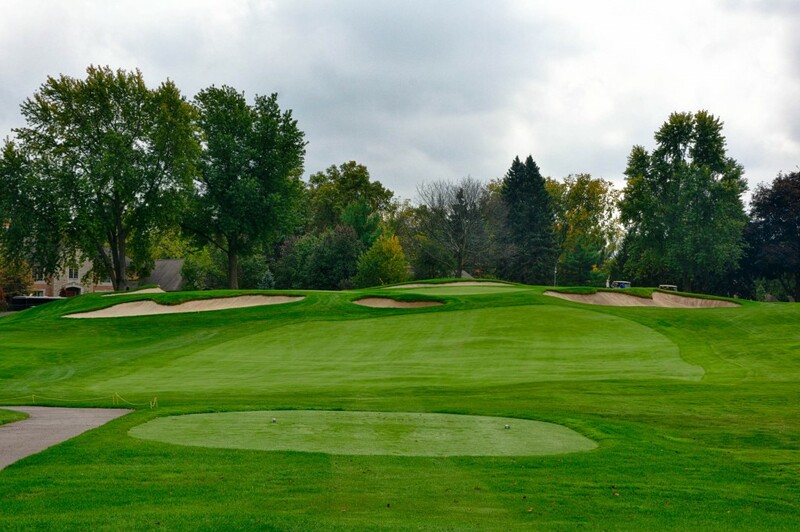 When you pull up to Oakland Hills there’s a small sign that says “members only” and then a very short driveway up to the bag drop in front of the back of the club. The attendant took our clubs and we parked the car and made our way to the mens locker room. Here you don’t use cell phones, and you don’t put your shoes on in the parking lot – you’re given a locker close to the member who is accompanying you and you do it in there. The clubhouse at Oakland Hills is hands down the most beautiful I’ve ever been in. From the locker room to the mens bar to the mixed dining room, it was all first rate. Our member hadn’t arrived yet, so we made our way to the range which was very nice, but surprisingly short. 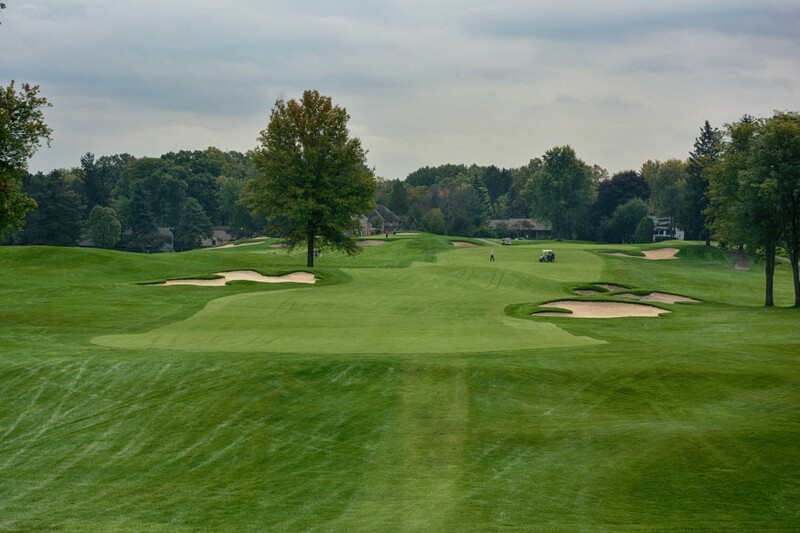 My first reaction was “I bet the pros could hit it 150 yards past the treeline.” I later found out that during tournaments like the Ryder Cup and PGA Championship that they use part of the North Course for a driving range – along with Parking. Denton showed up about 10 minutes later and we got to know each other a bit before heading to the putting green. This is when I got scared. The hole I’d picked to putt on was right at the crest of a hill. I knocked it up there to within an inch, and then watched it roll back down about 15 feet…3 times. I finally learned I could hit it above the hole and it would roll back down in – that was fun, I just prayed that the entire course wouldn’t be so evil. If that isn’t an unbelievable collection of tournaments – I don’t know what is. For everyone’s sanity we decided to play the white tees, which still measured 6,512 yards. And with that we stepped up the to the first tee on the 20th best course in the US. What you immediately notice about the first hole at Oakland Hills is just how narrow the fairways are. Bunkers within reach surround both sides and just beyond that are trees. We all sprayed our drives a bit, and mine was what appeared to be the least damaging lying just off the fairway in the rough. This was until we walked down and checked out the rough. Thick. Immaculately maintained, but thick. After having what was probably the best warm up I’d ever had, it was as though I’d forgotten how to play golf on this first hole. May have been because the gravity of the course I was playing had finally sunk in. A triple bogey is not how you want to start off when playing one of those “once in a lifetime” rounds. A shorter par 5 dogleg left, but not one I was even remotely thinking of going for in 2 as my goal now was just to keep the ball in play and try and make some pars. The tee shot is slightly blind with heavy bunkering along the left and at the dogleg on the right. Best shot is to keep it left center of the fairway, and then play smart shots all the way into the bunkered and elevated green. The first par 3 on the course was also the site of one of my best shots of the trip. I pulled out a 6 iron and picked an aggressive line directly over the front bunker. I cleared it by about 2 feet and the ball must have rolled within an inch of pin, stopping about 2 feet away. Putt in for birdie. This is one of those times where you can’t help but think “I bet at some point during a tournament Jack didn’t make birdie on this hole…” Nevermind the fact the pros were probably an extra 50 yards back. Another dogleg left with a narrow fairway. Slightly downhill approach with heavy bunkering. This was the point where I was starting to get concerned about all the dogleg lefts, which definitely do not play well to my fade. My driver was off all day, and this was one of the worst examples of it, slicing it hard and almost getting it to the 6th fairway. A creek runs through at about 280 out which on this day wasn’t reachable for any of us. There was a lot of extra room around the fairway and green here, I can only imagine the masses on a tournament day. One of my favorite holes on the front 9. Similar to 11 on the back, this is a short par 4 with bunkers everywhere, and you guessed it, yet again another narrow fairway. 3 wood or iron is the play here, as you don’t want to be in any of the bunkers on this course. If you’re not driving the ball well, this is a scary hole. Water all along the right and bunkers all down the left. I played 3 wood and landed it middle of the fairway about 140 out. It felt longer from the tee than it actually played. Short par 5, but don’t mistake that as easy. Straight away with very narrow fairway, bunkers everywhere and a pretty severely elevated green. Play 3 smart shots here, and this could be a good birdie opportunity. Long is better than short on the approach as those bunkers are exactly where you don’t want to be. During tournaments the course plays at a par of 70, this hole along with 18 are turned into par 4s. Playing 205 out, I heeded his advice and opted for my 3 hybrid. I wish I had a photo of where the ball landed – 3 inches to the left of the pin. It stopped about 4 feet from the pin and in all of my nervous glory I missed the putt and settled for par. They don’t make things any easier once you swing around to the back. I learned this the hard way. I was flying high after shooting a 43 on the front and playing some of the best golf of the trip. The back 9 would be a different story entirely. A long par 4 with a fairway that sloped in just about every direction imaginable. Also notice that one tree on the left, if you ever see it, tell it I want my ball back. There aren’t many places at Oakland Hills to hit it in the trees – but apparently I was determined to find every single one of them. Possibly my favorite hole on the course. Short par 4 with an S-Curve fairway and elevated green. Pop it over the left bunker to get some roll down to the base of the fairway and have a relatively short approach. Fun par 5 that requires a smart 2nd shot. Bunkers on the left and trees on the right with a sharp dogleg. You probably won’t reach the dog leg off your drive, but aim to the left side of the fairway to give yourself the best angle at getting close after 2. Depending on where you are you can cut the corner over the trees to get it closer to the green, but unless the pin placement is left, it probably won’t do you a whole lot of good. Elevated green with lots of fun bunkering. Hit the green or else. That’s pretty much all there is to say about this par 3. If you aren’t on the green, you probably won’t be liking where you do find yourself. The #2 handicap hole and the only one that I would say is just plain unfair. Measuring 456 yards (or just 20 yards shorter than a couple of the par 5s on the course) this hole is long and difficult. By the time I did finally reach the green, I had one of the more fun putts of the day that was a double breaker downhill from the front of the green. Luckily it was one of the better putts of the day and allowed me to save my triple. A note about the greens – personally I didn’t find them to be as difficult as I was expecting. I thought the greens on the River Course at Blackwolf and even on our prior days round at Forest Dunes were a little bit tougher. Looking back though I think that was a bit of a facade. I just was finally putting halfway decent at Oakland Hills. Dan had at least one 4 putt and a bevy of 3 putts, and he said of all the courses he played in Michigan, that OHCC by far had the most diabolical greens. While still a dogleg left, this is another fun one. With three giant bunkers right in the middle of the green you have to be smart off the tee. Best placement is left of the bunkers without being in the trees. This gives you a manageable approach shot to the uphill green. The signature hole on the course, and a daunting one from the tee. You need to get your ball far enough out to have a good play at the green, but even a moderate slice will leave you wet. The approach isn’t any easier as the water wraps farther around the back than you think, and well, there are bunkers everywhere else. In my case I was the only one to land on the green, and I still wasn’t very happy as I found this to be one of the most difficult greens on the course. We end with a solid chance at birdie on this short par 5. Downhill off the tee and then back up on the approach, the 18th green nestled at the base of the clubhouse is quite a sight and a somewhat sad one at that, as it meant our round, and effectively the trip had come to a close. One of those rounds you simply don’t want to end.. The member who took us out, Denton, told me on the 14th that we had to stay for lunch to try their home brewed IPA. Being from the Northwest and a bit of a beer snob, there’s no way I could say no to that. What I wasn’t expecting was the choice between their typical IPA and one aged in Woodford Reserve bourbon barrels – this became a no brainer. Bourbon aged beers are some of my favorite, and this was easily one of the best I’d had. A totally unexpected surprise to see at a historical golf club near Detroit. I would have had 3 of them had I not had to immediately drive 5 and a half hours to Milwaukee to catch my flight to San Francisco. Overall I actually enjoyed my round at Oakland Hills even more than I expected to. Although we played the front 9 at a fairly breakneck pace, and it wasn’t the most beautiful of weather days, the course was a lot of fun. It rewarded you for hitting good shots, and when you did hit those good shots, it truly felt like an accomplishment. It’s not hard to see why this course has so much history, and I just hope that one day I’ll be able to make it back and try and bring the “Monster” to it’s knees once again.